Shyamalan is clearly a talented director. He obviously understands film form and the language of cinema. But he treats the audience like a bunch of 5-year-olds who don't have the deductive reasoning powers to actually think about what they're watching, so we get a movie filled with ridiculous coincidences and forced plot points. He constantly backs himself into creative corners constructed by his own ego. By the time we reach the end of the film, he actually has a character state the theme of the movie just in case it hadn't been beaten into our heads enough before that. Through the performances of the mostly non-professional cast (Taylor Momsen, as Alex's girlfriend, has been around for a while though...my how far Cindy Lou Who has come), Paranoid Park captures the essence of high school life better than most teen movies could ever dream. Van Sant achieved a similar feat in the Palme D'Or winning Elephant five years ago, but despite some truly beautiful moments in that film I have never really been a fan of it. Here, however, Van Sant has achieved something very close to breathtaking. The blurred images of soaring skateboarders that repeat throughout the film take on a hauntingly surreal beauty, almost as if they are a foggy notion of what Alex could one day achieve, or something he sees begin to fade away as a tragic accident changes his life forever. Director Thomas McCarthy's last film, The Station Agent, was an impressive, beautifully burnished debut filled with indie quirk and charm. Here McCarthy trades in the quirk for a nagging sense of melancholic gloom, punctuated by warm hearted connections between kindred spirits from two vastly disparate backgrounds. McCarthy still falls back into some typical indie crutches - the early scenes depicting Vale's lonely existence are straight out of the independent film handbook. 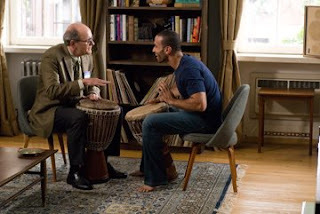 But soon The Visitor finds its groove, and settles into something truly beautiful and deeply moving. Matthew I am thrilled to see that someone (other tha me) loves THE VISITOR deeply. With FOUR MONTHS a 2007b film for me, THE VISITOR make a strong claim to be the #1 film of 2008 so far. I know you don't quite like it that much, but you have been a steadfast champion for it from the very beginning. I tip my cap to you. The film is an emotional powerhouse, and I like what you say here about THE STATION AGENT as well. As far as your comments on PARANOID PARK (and the rating you issue it) I think you are dead-on. I was a little more tolerant of THE HAPPENING than you were, but almost everyone agree with you. Still, even for me it is barely passable.